Sitting atop the rim of Bluestone Canyon the views from the Pipestem Resort alone are worth the trip to this southeastern corner of West Virginia. But if you’re like most of us golfers and more than a little obsessed with the game, teeing it up on the Geoffery Cornish designed course provides an added treat. Not overly long but with some striking changes in elevation, the Pipestem layout plays from the back tees to 6,884-yards but for less accomplished golfers, ladies and seniors there are three other sets with the most forward playing a friendly 5,018-yards. Visitors though, will find out from whichever tees, the vistas of the resident wildlife not to mention the canyon will be etched in their memory. During a recent visit deer were much in evidence with a curious 6-point buck gallerying my second shot from less than 50 feet on the very first hole. Add to the natural attractiveness of the Resort and its surroundings, the welcoming touch from PGA Professional Bob Biroscak and his staff, no one stays a stranger at Pipestem for very long. The course and resort are part of the West Virginia State Parks System with a lodge and cottages plus conference facility and restaurant. Besides golf though Pipestem offers lots of other activities such as hiking, mountain biking, horseback riding and both outdoor and indoor pools plus in the winter there are miles of cross country ski trails. Fishermen, after all you can’t spend all your time on the course, can try their luck for trout in Pipestem’s 16-acre stocked lake. The resort also offers outdoor entertainment in their amphitheater during the summer months. 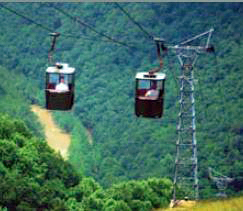 Any visit to Pipestem should include a ride in the tram from the canyon rim down to Mountain Lodge at the floor of Bluestone Canyon on the banks of the Bluestone River. The lodge, whose only public access is via the tram, has 30 guest rooms and a restaurant and is certainly worth the trip. The tramway open in 1971 and over its 3,400 foot length drops almost 1,100 feet giving riders panoramic views of the mountains and river plus a glimpse of a moonshiner’s former hideout in one the mountainside caves. Pipestem Resort is a special place, for golf, for nature and for all the great things you can do.